The Six of Air represents a solution born of compromise that lies somewhere in between the black-and-white, either/or choices that are so often seen as the only options available. Now is a good time to contemplate and compare a range of different options in order to discover the best solution for one and all. Therefore, it is also time for research and investigation. As you consider the options, compare, take notes, weigh the pros and cons for each. There might be a need for compromises to be made, as sometimes, in order to achieve our goals and objectives, compromise is required. Now is not the time to prevent an outcome by being inflexible and taking a rigid stance. The Six of Air also represents that singular moment of revelation and illumination, when the mind opens and at once understands the extent of the power we have over our lives. Suddenly, you see the potential in everything. You see how every experience and choice made by you and others has shaped you and your life and brought you to this moment. In turn, you also understand how every choice you make in the present will shape your future. In that moment of recognition, the mind changes in an instant, and so does life itself. The Six of Air is presenting you with the opportunity to act with mindfulness and awareness. From this moment onward, choose to take responsibility for your thoughts, beliefs, and actions, understanding that even by taking a passive or inactive role by doing nothing or by allowing others to make decisions on your behalf, you are making a choice. Own it. The only drawback is that you will no longer be able to blame others for stealing your power if it was your choice to give it away. This is your moment to come of age and own your power. The Six of Air signifies an opportunity to empower and illuminate your life by opening your mind. 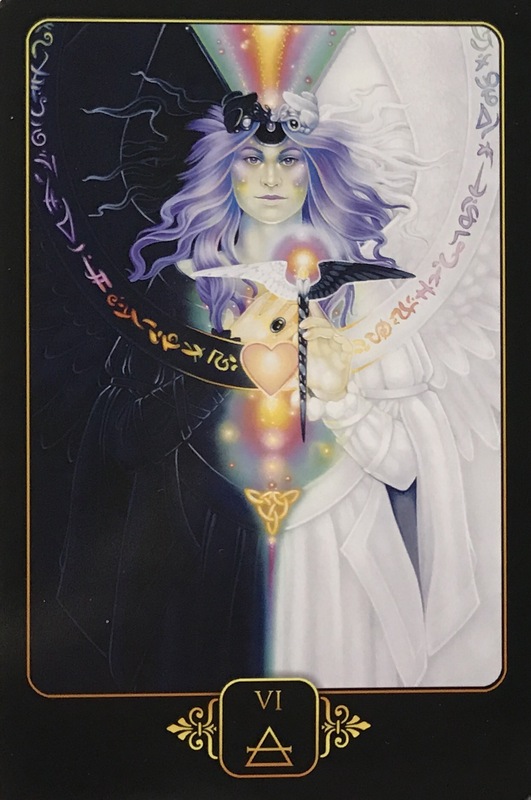 This entry was posted in Artist, Deck Review, Featured Card of the Day, General Tarot, Readings and tagged 6 of Air, Dreams of Gaia, Ravynne Phelan, Tarot.